The ORMA modular formwork is perfect for the construction of all kinds of vertical concrete structures, both in building construction and civil works (walls, columns, abutments, footings). It’s distinctive for high performance rates with minimum labour costs and erection time. The system is comprised mainly of panels which, joined by clamps, make up formwork gangs. It has items that provide efficient and safe solution for all types of geometries. Very versatile: lateral holes for fast erection of standard solutions (bulkheads, corners, columns, etc.). Minimum work on infillings and compensations. Panel connection with clampsand a single hammer blow. - Adjustment of clamp enables compensations of up to 10 cm. Robust panel with galvanised steel frame and reinforced corners. Connecting element between panels and corners. Excellent finishing due to high-quality phenolic birch plywood. Wide height range of panels: 3.3 m; 2.7 m, 1.2 m and up to 3.3 x 2.4 m (7.92 m2). Safety items: SBU Safety Platform. Galvanised metal platform with accesses designed for wall formwork work at height (bracing, concrete pouring, etc.) with absolute safety. The Racibórz Dolny Dam, designed to control flooding in the area, will have a total holding capacity of 170 million cubic metres, placing it at the forefront of such projects in Poland. Projects such as this open pit mine, composed of many unique structures, require unique solutions with products adapted to the specific demands of the project. Młociny Large Shopping Centre, a surface area of over 220,000 m² in the heart of Warsaw. Crane free, self-climbing system. Allows high construction speed and provides multiple applications for each high-rise project. Safe lifting and handling. Flexible rail-guided climbing formwork for high-rise buildings. Highlights: optimised structure and easy to use. Crane-lifted climbing system, perfect for the construction of double-sided walls and piers. High performance one-sided climbing formwork for the construction of strongly inclined walls with total safety. Movable system for the construction of very long single or double-sided concrete walls. Easy formwork erection and stripping. 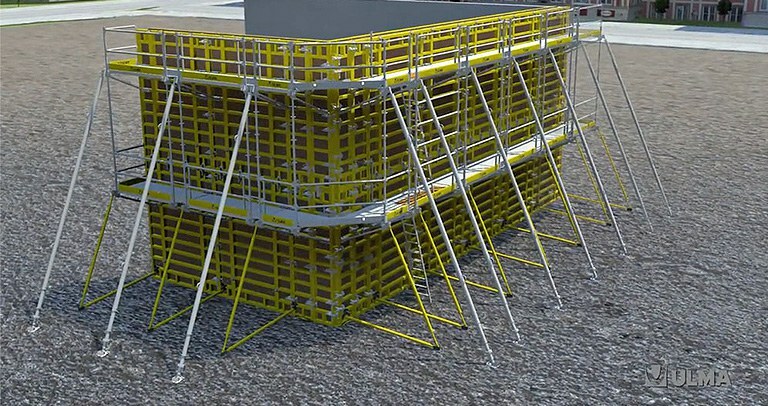 Modular safety platform, adaptable to different geometries. It can be assembled on the ground. Easy transport and storage. Most suitable for the construction of considerable height walls. Easy to transport and handle. Optimised safety platform designed for wall concreting tasks. Very simple assembly. Tough plywood with smooth surface most suitable for different needs. It enables more repeated uses than conventional plywood and offers excellent fair-faced concrete finish.